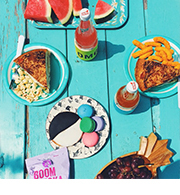 It’s time for summery breakfasts. Breakfast to match our no-sleeves and shortie shorts. Let’s fill our pockets with snacks and go for a long walk. Let’s fill our bagels with berries and top them like they’re donuts. These bagels may be a two-day ordeal, but don’t let that stop you. The first day is no biggie, and the second day involves boiling and baking. 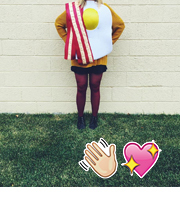 It pairs perfectly with morning coffee and mis-matched pajama wearing. I took one bite and proclaimed these my favorite bagel! True story. The dried strawberries make these taste like sunshine, and the cream cheese makes these taste like dessert. Day one: make the sponge. Whisk yeast and a big pinch of sugar into water, in the bowl of your stand mixer. Set aside until foamy, about 5 minutes. Add flour, whisking or stirring until it forms a smooth sticky batter. Cover the bowl with plastic wrap and leave at room temperature for approximately 2 hours, or until the mixture becomes foamy and bubbly and has swollen to near double in size. Make the dough. In the same bowl, add the additional yeast to the sponge and stir. Then add the salt and honey. Slowly add 3 cups of flour and dried berries to the mixture. Stir or mix on a low speed with a dough hook until the ingredients form a ball, slowly working in the remaining 3/4 as needed to stiffen the dough. Knead by hand for 10 minutes or 6 minutes by machine. The dough should be firm, stiffer than your average bread dough, but still pliable and smooth. Immediately divide the dough into twelve 4.5 ounce pieces for standard bagels or twenty three 2.3 oz pieces (like I made here). Form the pieces into rolls. Cover with a damp towel for 20 minutes. Meanwhile, line two baking sheets with parchment paper and mist lightly with cooking spray. Shape the bagels. Poke a hole in the center of a ball of dough and gently rotate your thumb around the inside of the hole to widen it approximately 2 inches in diameter or 1 inch for the smaller guys. Place each of the shaped pieces 1-2 inches apart on the prepared baking sheets. Mist the bagels very lightly with cooking spray and cover lightly with plastic wrap. Let the pans sit at room temperature for about 20 minutes. Refrigerate overnight, or for a few hours. Day two: (the following day or when you are ready to make the bagels), preheat the oven to 450°F. Bring a large pot of water to a boil and add baking soda. 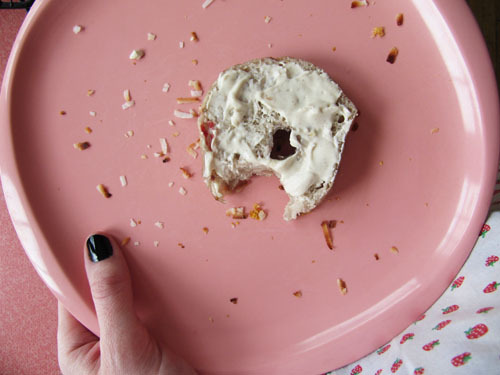 Remove bagels from the refrigerator and gently drop them into the water, boiling only as many as comfortably fit. (They should float.) After 2 minutes flip them over and boil another 2 minutes. (If you like your bagels a little less chewy boil and boil only 1 minute on each side.) While the bagels are boiling, sprinkle the same parchment-lined sheet pans with cornmeal. 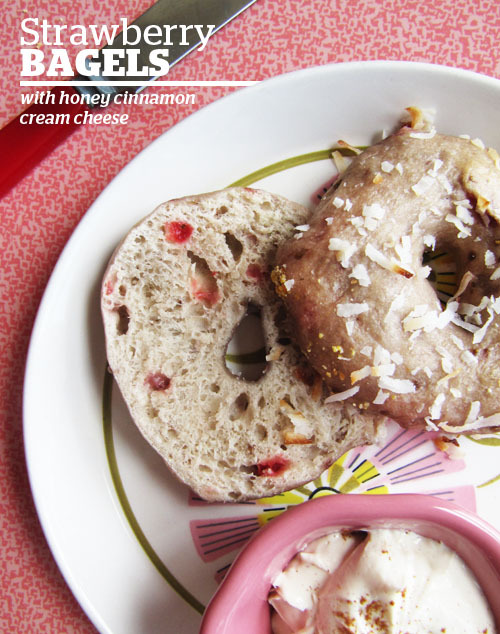 Sprinkle the bagels with coconut as they come out of the water. When all the bagels have been boiled and topped, bake for 5 minutes then rotate the pan and then bake 5-7 minutes or until golden brown. Beat together all of the ingredients until combined. Chill until ready to top your bagels. P.S. I bought mine at Trader Joe’s, but you can find them online here. those are some bagel beauties! way to be a super baker on the weekends! Thanks girl! I wish I could share them with you! I haven’t had a bagel in years, and I’ve never made them, but I’ve been craving one, so these just might have to go on the recipe agenda! 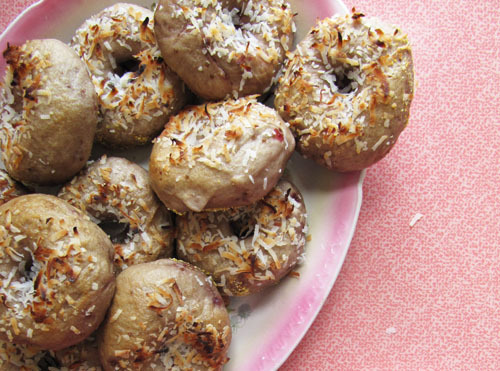 It’s pretty genius to sprinkle bagels with coconut! These look so tasty! 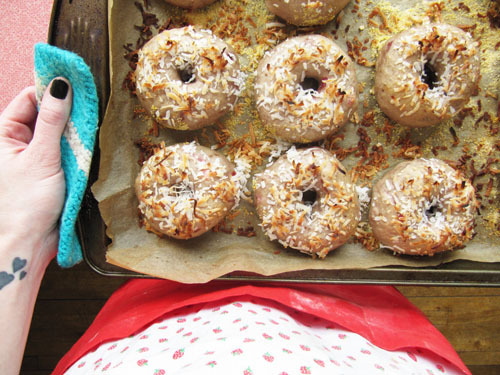 The coconut on top totally reminds me of the donut I used to get all the time as a teenager. And thanks! I’m not sure how I did it either! 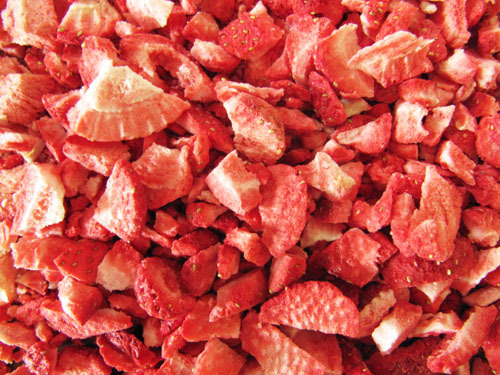 Strawberries and coconut are where it’s at! With strawberry jam you have a strawberry miracle!! Can i make these with fresh strawberries ? !